If you’re anything like me, you will have a tendency to always be looking for that amazing skin product or treatment that will somehow miraculously give you gorgeous skin. And all you will have to do is apply this to your face and that will be that. Perfection. Problem solved. Somewhere along the way, we begin to realise that this is about as feasible as the handsome prince turning up at just the right moment to wake us up with a kiss, with whom we then live happily ever after. Yes there are some truly wonderful products out there (and I’ve been writing about them) but at the end of the day, applying these products to parched, undernourished skin is a waste of time and money. Nothing will make your skin glow more, than looking to it’s health. Here, nutritionist Fleur Borelli looks at some easy ways to achieve just this. Your skin has the potential to reveal all your secrets…. when you blush with embarrassment, or you have had a late night or when you are feeling under the weather. Of course you can cover up some of the tell-tale signs. But what is the true recipe for a permanently glowing complexion? The major vitamins that keep your skin healthy are A, B2, B3 and C. Vitamin A is unrivalled as a skin rejuvenator because of the critical role it plays in the normal life cycle of a skin cell. Deficiency of vitamin A can cause skin to become parched and dry and wrinkle-prone. Carotenoids are what give orange and yellow fruits and vegetables such as carrots and peaches their vibrant colour. And it is these carotenoids that get converted to Vitamin A. Liver and fatty fish are rich sources of Vitamin A and the latter also provide essential fats for the body that can help combat the first signs of skin aging. Good sources of B vitamins come from leafy green vegetables, eggs, lean meat, chicken, turkey and game. Deficiencies can contribute to skin conditions such as dermatitis, dryness and acne. B3 is particularly important for supplying all the energy your skin needs to regenerate and repair. Vitamin B5 also helps to promote faster healing of skin wounds and is more efficient when combined with vitamin C which can be achieved through eating a balanced diet. Vitamin B12 is also key to healthy skin and nails because of the part it plays in the formation and red blood cells. .Deficiency of B12 can lead to the development of anaemia, a sign of which can be very pale skin under the nails. Vitamin C is found in most fruits and vegetables and is the wonder-vitamin par excellence for your skin. It is absolutely necessary for the production of collagen which is the main structural protein in the skin. Collagen works with another protein elastin to give skin its incredible resilience, firmness, shape and ability to bounce back. Minerals such as zinc and iodine are outstanding contributors to the normal structure and function of skin cells. Zinc deficiency can result in spots appearing on your nails, the development of stretch marks, acne and slow healing of wounds. Whilst iodine is considered an important nutrient for your thyroid, it is also important for your skin. Without it, you would not be able to sweat and release toxins. Another mineral, copper is responsible for normal skin pigmentation. The richest sources of zinc are oysters, beef, spinach and nuts. Oysters also contain copper as do kale and mushrooms. Seaweed or edible algae are both rich in iodine and emerging as new superfood ingredients. How much you should drink each day depends very much on your body weight, temperature, levels of physical activity and salt content in food. However one thing is for sure, you should allow yourself to get a little thirsty as this is normal physiology. Then drink plenty so you feel you really have hydrated well. This way your cells will be properly hydrated and your skin will look plumper and firmer. Water helps to hydrate the skin, but it is also a means to ensure that all important substances reach the skin. Drink at least 2 litres of liquid a day. Your skin thrives on you having a good metabolism. The best way of stimulating your metabolism is by exercising regularly. It is also a good way of relieving stress. Stress, agitation and poor sleep are, of course, disastrous for the skin. Allow yourself to relax sometimes, just let yourself go. Run a lovely herbal bath, or take a sauna or have a massage. When you feel better, you also look better. And consider taking a multi-strain probiotic if you are prone to stress or anxiety as this can help prevent nervousness revealing itself through skin conditions such psoriasis or rosacea (1). Treat yourself to an avocado and oatmeal facial – it is easy to do at home! 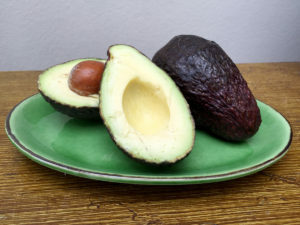 Avocado contains a substance called perseose (2) which increases filagrin expression in the skin. Filagrin is what provides us with our anti-inflammatory protection against bacteria and viruses. Beta-glucans in oatmeal are known for having a balancing effect on the immune system (3). They are great for calming down angry rashes or outbreaks on your skin. .Just remove your makeup and wash your face with warm water. Mash some avocado and mix it with a little oatmeal and apply it to your face. Leave it there for 10 minutes, then rinse it off with plenty of water. And it does not have to be just your face that benefits. Use this pack anywhere you have sensitive itchy skin. Much as it’s great to get your vitamins from your food, sadly our diets are not always quite what they should be. Added to that the soil is now very depleted and the world has become full of many toxins. Supplements can help ensure that you get all the nutrients your body needs.